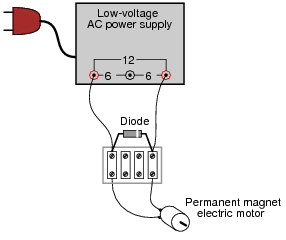 What would this permanent-magnet DC motor do, if powered by a source of AC voltage? The motor would vibrate, as the shaft tries to rotate back and forth as quickly as the AC cycles. Discuss this phenomenon with your students. Ask them whether they know of any other "polarized" (DC-only) devices. Ask them what they think would be necessary to make a DC-only device function on AC power. What would this permanent-magnet DC motor do, if powered by the following circuit? The motor would spin in one direction, with a pulsing torque. 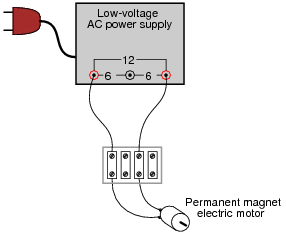 Follow-up question: identify the polarity of the DC voltage between the motor terminals. Ask your students why the motor's torque pulsates instead of being steady as it would be when powered by a battery. Is this necessarily a bad thing? How does the motor's speed compare with being powered by a DC source of the same (RMS-equivalent) voltage? The motor would spin in one direction, at least for a short moment in time. Then, something in the circuit (either the diode or the power supply) would fail due to excessive current! Follow-up question: identify the polarity of the DC voltage between the motor terminals, during that brief period of time where all component are still functioning. Ask your students why this circuit is self-destructive. If it functions as a rectifier for powering the DC motor for a short period of time, then why doesn't it function that way for an indefinite period of time? Explain how this circuit is able to make the light bulb glow brighter and dimmer. With the switch in the "dim" position, the light bulb only receives power for one-half of the AC cycle. Follow-up question: does it matter which way the diode is oriented in the circuit? If we reversed its connections, would the light bulb behave any differently? Although this circuit is not very complex, it reveals an application of diode rectification often overlooked: power control for non-polarized loads. Ask your students how the energy efficiency of a circuit like this compares to a rheostat (resistive) light dimming circuit. Also, determine the polarity of DC voltage across the load resistor. This question not only introduces a type of full-wave rectifying circuit, but it also serves as a good review of transformer action and winding phase markings. 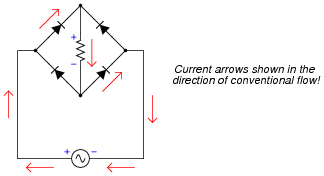 I have omitted diagrams showing direction of currents in this circuit, partly because they may be ascertained by way of the load resistor's voltage polarity (shown in the answer), and partly because I'd rather not have to choose between giving an answer in conventional flow notation versus electron flow notation. In this rectifier circuit, the output voltage is less than half of the secondary winding's rated voltage (12 volts). Why is this? Also, determine whether this is a half-wave or a full-wave rectifier circuit, and explain your answer. Only one-half of the secondary winding powers the load at any given time. This is a full-wave rectifier circuit. Challenge question: what would have to change in this circuit to make it a half-wave rectifier? If this question is confusing to some students, take time to discuss the directions of all currents in the circuit through both halves of the AC cycle. Then, the answer should be apparent. 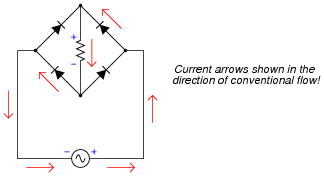 Follow-up question: draw the direction of currents through the bridge rectifier for each half-cycle of the AC power source, and determine the DC voltage polarity across the light bulb terminals. 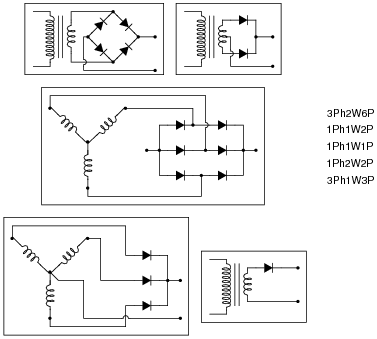 Realistic connection problems such as this are much easier to solve in the presence of a schematic diagram. If you have students who struggle with this question, make sure they take the time to draw a schematic first. 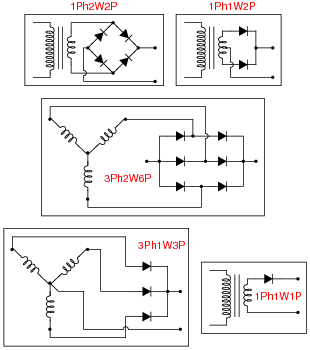 Finding a schematic diagram of a full-wave bridge rectifier circuit to copy is no challenge at all. As a rule, I do not offer assistance to students with questions until they have at least taken this first step, because so often they end up answering their own questions in the process of drawing a schematic diagram! Note: the voltage readings shown by the voltmeters are approximate only! Challenge question: how could the 58 volts from (-) to ground be eliminated, so as to permit grounding of the (-) output terminal? Direct rectification of a grounded AC power source results in significant voltage being dropped between either DC output conductor and ground. Ask your students what kinds of problems might be caused by this effect. How about safety? Ask them if they think 58 volts presents a safety hazard. In answer to the challenge question, what is needed here is some kind of electrical isolation. There is more than one answer to this problem, but definitely one solution that is more popular than the others. However, the technician is surprised to find that the fuse blows every time she turns the power on to the circuit. When the oscilloscope is disconnected from the circuit, the fuse does not blow, and everything works fine. What is wrong? 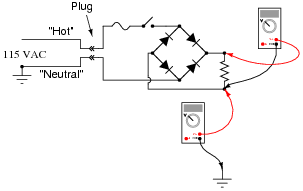 Why does the oscilloscope cause a fault in the circuit? Here is another interesting piece of information: if just the probe tip is touched to one of the rectifier circuit's output terminals, the oscilloscope shows a half-wave rectified waveform, without the ground clip being connected to anything! The oscilloscope's "ground" clip (the alligator-style clip that serves as the second electrical connection point on the probe) is electrically common to the metal chassis of the oscilloscope, which in turn is electrically common with the safety ground conductor of the 120 volt AC power system. The answer given here does not reveal everything. 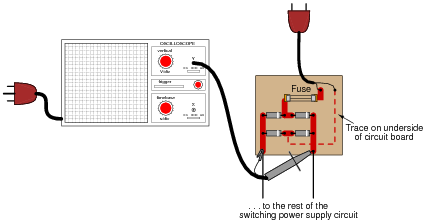 The student still must determine why grounding one of the rectifier circuit's output terminals results in a ground fault that blows the fuse. The observation of a half-wave signal with just the probe tip touching the circuit is the big hint in this question. The meaning of these labels can be confusing, so be sure to discuss them thoroughly with your students. Have them tell you what "Phases," "Ways," and "Pulses" mean, using their own words. These devices would be even more useful to us if they were able to control alternating current (AC), but they cannot. Bipolar transistors are polarized (one-way-only) devices. Explain how this circuit functions. How is the transistor (a DC-only device) able to control alternating current (AC) through the load? 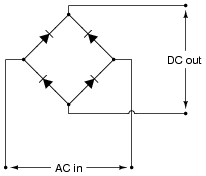 The four-diode bridge rectifies the AC load's current into DC for the transistor to control. 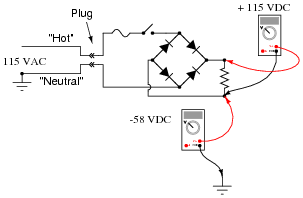 Usually, rectifier circuits are thought of exclusively as intermediary steps between AC and DC in the context of an AC-DC power supply. They have other uses, though, as demonstrated by this interesting circuit! It should be of no consequence if students have not yet studied transistors. In fact, it is a good thing to give them a very brief introduction to the function of a previously unknown component and then have them examine a circuit (the rest of which they should understand well) to ascertain an overall function. This is sometimes called the "Black Box" approach in engineering, and it is necessary when working around state-of-the-art electronic equipment, where you are practically guaranteed not to understand the inner workings of every subsystem and component. Explain why these resistors are necessary to ensure long diode life. The answer to this question should not be much of a challenge to your students, although the follow-up question is a bit challenging. Ask your students what purpose the swamping resistors serve in this circuit. What do we know about current through the diodes if one or more of them will fail due to overheating without the swamping resistors? What value of resistor would your students recommend for this application? What factors influence their decision regarding the resistance value? Diode D1 fails open: Load receives 2-pulse rectification instead of 3-pulse, increased voltage across D1. 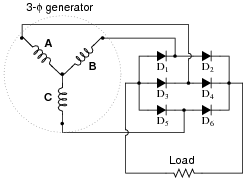 Generator winding C fails open: Load receives 2-pulse rectification instead of 3-pulse, no current through D3. Center connection joining generator windings fails open: No voltage across any diode or across load, no current through any diode or through load. Diode D3 fails open: Load receives 5-pulse rectification instead of 6-pulse, increased voltage across D3. Generator winding C fails open: Load receives 2-pulse rectification instead of 6-pulse, no current through D5 or D6. Also, mark the polarity of the voltage drop across Rload. Have your students explain their reasoning when tracing currents and determining voltage drop polarities in front of the class for all too see. The bridge rectifier circuit is one that many students find confusing to analyze, and so it is worth spending time on in class to fully understand.